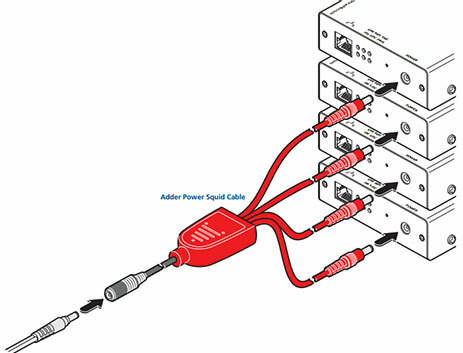 The Adder CAB-XSERIES-4WAY-PWR is a 4-way power distribution cable for use with up to 4 ADDERLink iPEPS devices powered with the 4 Amp PSU-IEC-5VDC-4A - sold separately. Please note: The CAB-XSERIES-4WAY-PWR requires the purchase of a separate power supply to operate. Two IPEPs devices can be powered with the 2.5 Amp PSU-IEC-5VDC-2.5A. For 3 or 4 iPEPS devices, use the heavy-duty 4 Amp PSU-IEC-5VDC-4A.